Here are the ten most popular questions we are asked about ScaleGuard – please click on a question to view the answer. How does the ScaleGuard Work? 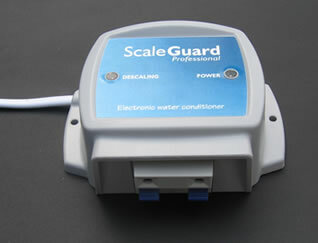 The ScaleGuard uses modern technology to create an electrical field that changes the behaviour of scale forming calcium. This action stops further scale build up. The unit can be fitted on copper, plastic, steel or lead pipes. The ScaleGuard can be fitted on any pipe size up to 1" external diameter. The unit costs about £10.00 a year in electricity. You can order ScaleGuard over the phone, by post or online. Please see our Prices and Ordering Page for details.